First of all, I want to thank Karina Toral, who was the person that gave me the following step by step of the cheapest way of how to print the master thesis at the Hochschule Heilbronn. During my second year at Hochschule Heilbronn, I helped friends from Ecuador and Brazil to print their thesis while they were already on their respective countries. Plus, I also finished and printed my own thesis “Fostering the Cultural Support of the Mexican Entrepreneurial Ecosystem”. I only spent 11.5€ during the whole process of printing my master thesis. I don’t think that it worth to spent money on printing copies of the master thesis, therefore I looked for the cheapest option to fulfill the university requirements. Thankfully, my supervisor Graciela Kuechle only asked for an electronic copy, so I only have to print one for the Prüfungsamt. I want to help all those HHN students who are looking to save some money in this process, therefore here I share this tips with you. I’m assuming that you are already done writing your thesis, so here is the step by step to print your thesis. The university printers have those crappy brownish paper, therefore it will be required to buy some white paper. At Aldi, you can find a pack of 500 sheets for around 3.5€. Sometimes it is quite hard to find where are the sheets in Aldi, but usually it is on the area near the cashiers. If you don’t find them ask the customer service. If you want some more fancy paper, you can go either to Media Markt or Staples. Once that you have the paper, head back to the university and go to the computer room. It is important that you have enough printing credits at the university. This is what reduces the cost of printing! Printing at the university is cheaper compared to printing in some other places, even if you have to add some credits. For a thesis with nearly 80 pages and printed in color will cost around 6-8€. You should send the document to print, and afterwards you can put the paper on the printer. In normal class session, the computer room is open from Monday till Friday. On holiday season the computer room is open only from 9 am till 2 pm. Use your login details and open the PDF file. 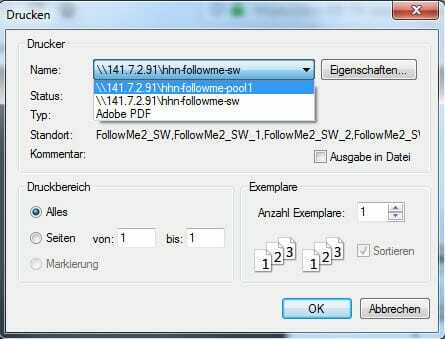 Select the color printer “141.72.91/hhn-followme-pool1“. Go to printing properties or as read in german “eigenschaften”. 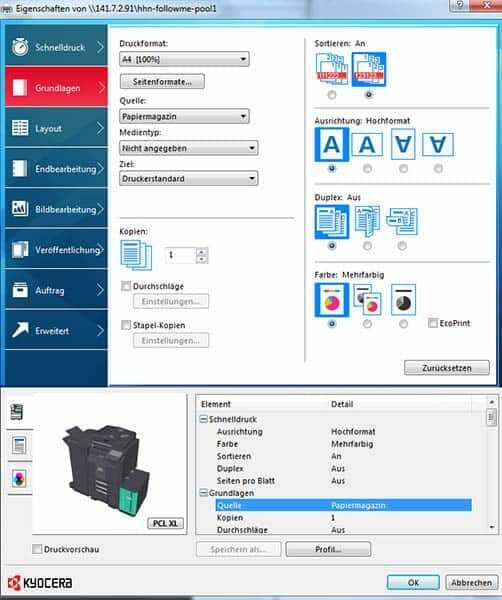 You will have to select the paper source, so that the printer will take the white paper from the slot #5 which in the properties is called Papiermagazin. Where it says “QUELLE” in the printing properties, you will have different options. When changing this option, the image of a printer below will start to change the color of the source. The source will be highlighted in a blue-green color. Select the option source until the bottom right part of the printer is highlighted. Also, be aware that “Farbe” is selected. I’ll recommend to do a print test before printing everything. Once that color and paper source were selected, you are able to print. The printers that are next to the computer room have a slot where you can add the white paper. Add the white paper at the top. Login with your ID credentials and print your document. If you are not sure that you have done the process correctly, you can always do one page printing practice. Now that you have printed all your thesis you have almost done most of the process! At the following place, CopyShop, it is possible to bind the thesis for 8€ with a soft cover or 24€ for a hard cover. You don’t have to do a previous reservation or call, you can just stop by and leave your thesis. It takes around 1 or 2 hours to bind the thesis. Depends on how many thesis you need, and how much workload they have. The owner is a woman around 50 years old, she is really nice, and she gives you a Duplo Chocolate after paying. Please, don’t forget to say her that Carlos the mexican recommended this place. I don’t earn anything but it is nice. Now that you picked up the thesis you are done with the printing process. Hand in your thesis to your supervisors and Prufüngsamt and wait for the best results. Monday, Tuesday, Wednesday, Friday: 9:15 to 11:45. The room is B012 for MIBIM and MITM students. For other study careers. Here is the link to supervisors. You have finished with your studies. If you find this post useful, don’t forget to share it, or leave a comment. Thank you so much for the detailed advice!! You are the best ! !